Define ‘responsive website design‘: it refers to a website that automatically conforms itself, regardless of browser, to any device’s screen resolution (= width & height). Assuming the website has been developed to modern mobile standards, it uses a Cascading Style Sheet (CSS) media query to determine (at light speed) what resolution a visiting device has and then, using flexible images and grids not only sizes but repositions or stacks, itself accordingly. Websites must be designed understanding image & graphic conformity as a priority, which is NOT to be confused with static or print design! Why Does Google Demand! 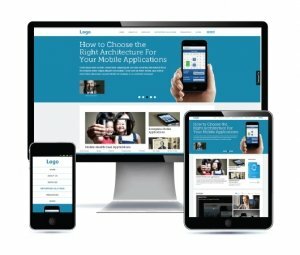 Mobile Responsive Website Design? Because Google insists on giving its search-consumer the best user experience possible, if the website is NOT responsive they DO NOT consider it a good experience and will rank it accordingly … if at all! See our latest Mobile Responsive website design work! NOT an app or a second mobile site, responsive website design is all inclusive! It makes managing one web presence that can satisfy all visitors on all devices possible! While visitors on a desktop computer may see your entire site, unless all of its elements are developed to adjust to unique screen sizes, they will inevitably be forced to pull, pan, and scroll on a mobile device. It’s not the ideal experience for visitors you hope to convert as clients. And while there is NO NEED to develop a 2nd mobile website, new content, new URLs and an entirely new set of competitive SEO processes – all business owners should consider the best visitor (and search engine spider) experience possible a GIANT priority! And Note: we can always re-develop any existing website ‘Responsive’! If you’re thinking about mobile get in touch, we’d love to answer any questions or discuss your Mobile Options today!